Two kilometers north of Mykonos Town, just after Tagoo, this area offers beach access, good public transportation, a variety of accommodation, and beautiful sunset views. 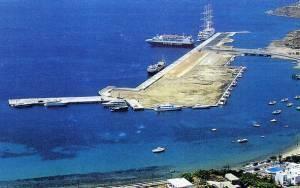 The protected bay is the anchorage for the many cruise ships visiting Mykonos, and the new port is located here. The area has lovely views of the ships at anchor, especially pretty at night. The area is also known because the famous icon of Our Lady Holding the Infant Jesus was found here floating on the bay. The icon, made of a masticated blend of Chios mastic and wax, is kept in the famous 16th century Monastery of Tourliani in Ano Mera. During the winter, it can be seen in the Greek Orthodox cathedral in Mykonos Town. The new four-star Paradision Hotel is located above the New Port at Tourlos and only 50 meters from the beach.